My First Godzilla holds a destroyed city bus in his hands. Have you ever wanted to hug Godzilla but been a bit too nervous? Always wanted to introduce your children to the King of the Monsters, but feared for their safety? This is completely understandable - that's why the great folks at Toy Vault have made the soft and huggable Godzilla My First Godzilla Plush! 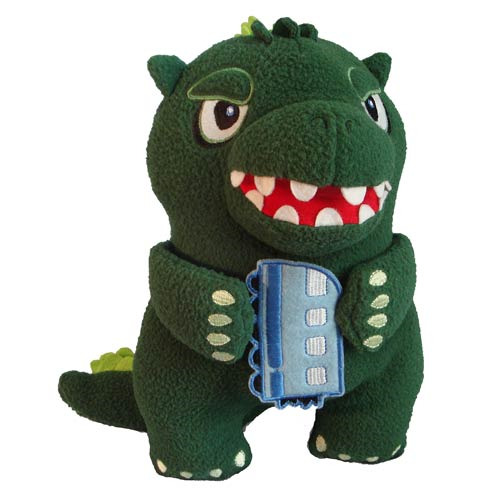 Made from soft, child-friendly fabrics and safety-checked for ages 3 and up, the My First Godzilla plush is perfect for fans young and old. My First Godzilla measures 10-inches tall x 6 1/2-inches wide x 5-inches long. Don't let your kids learn about Godzilla on the street. Order this instead! Ages 3 and up.